I am very proud of the fact that all three of my big kids (the ‘bigs’) know their way around a kitchen. Each one has his/her own way of cooking and baking as well as his/her own specialties. For Shoshana her cupcakes and omelets are the best. One of her 16th birthday presents was a cooking class with an incredible pastry chef, Jennifer Reed. I picked Shoshana up at the end of the session and saw the most beautiful turtle and sea scene decorations that had been made from fondant. Shoshana is always trying different recipes and sharing her cupcakes with others, a trait mommy loves. Recently, she baked mocha cupcakes with cappuccino frosting. I had one bite and fell in love. These cupcakes are very moist and chocolaty and work beautifully with the creamy, smooth, buttery cappuccino frosting. 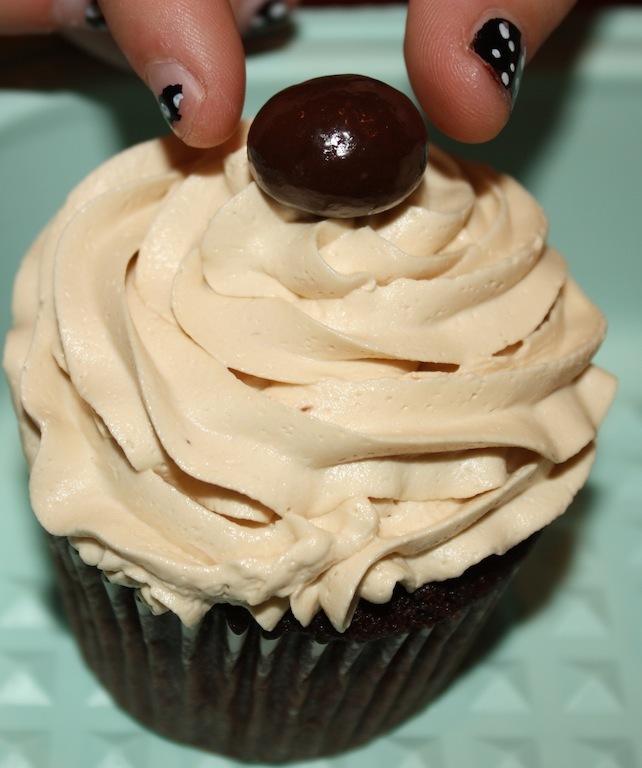 Shoshana found chocolate covered coffee beans and knew this was what she wanted on top of each cupcake. After realizing how much I loved these cupcakes, Shoshana offered to bake them for the blog, which meant that the process would be a bit slower with pictures having to be taken each step of the way, a sacrifice of sorts for a 17 year old. I went from baker and photographer to photographer and dishwasher and loved every minute of it. Time in the kitchen with Shoshana baking is really special for me. She even let me frost a few of the cupcakes, which is my favorite part. Until such time as the ‘bigs’ decide to get in the kitchen together and make a meal, I shall treasure the one on one time that I am given. I will even try to remember to smile through all the dirty pots, pans and mixing bowls. After all, gloves were invented for a reason. Preheat oven to 350°. Line a cupcake pan with paper liners. Set aside. Combine coffee, espresso powder, milk and vanilla together. Set aside. In a separate bowl, whisk together flour, cocoa powder, baking powder, baking soda and salt. Set aside. Beat butter with sugar and brown sugar for 3 minutes, scraping down the bowl as needed. Add the egg. Blend in ½ of the dry ingredients, followed by the milk/coffee mixture. End with the remaining dry ingredients. Be sure to scrape the bowl down in between additions. Use a large ice cream scoop or ladle to transfer the batter evenly between the cupcake liners. Bake at 350° for 17-20 minutes. The tops will spring back when gently touched and a toothpick inserted into a cupcake will come out clean. Mix espresso powder into vanilla. Combine butter, powdered sugar and vanilla mixture into large mixing bowl. Stir on low speed until blended. Beat on high speed for 3 minutes, scraping the bowl down as needed. Cut a small piece off a bottom corner (not the side that closes) of a gallon size freezer bag. Place a large star or round pastry tip into the opening. Transfer the frosting to the bag and seal it. Gently squeeze the frosting onto the cupcakes, starting on the outside and working towards the center. 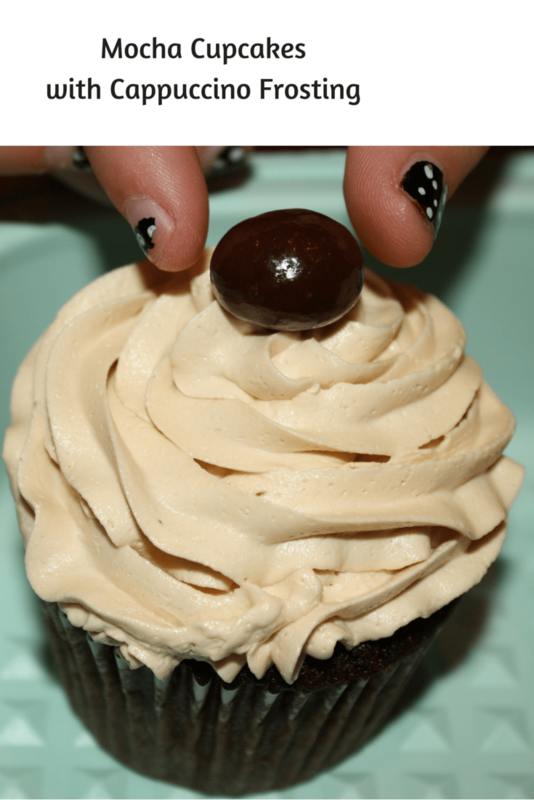 Top each cupcake with a chocolate covered coffee bean. When Shoshana bakes these cupcakes, sometimes the recipe makes 12 and sometimes it makes 13 cupcakes. When I asked her why it differs, Shoshana explained to me that sometimes she does not fill the liners as high, thus giving her one extra cupcake. If you find yourself with 13 cupcakes, reduce the baking time a bit. Yummy! What a loving gift you’ve given your daughter, Betsy…Lessons are undoubtedly helpful but obviously she’s inherited a natural talent from mom! Shoshana has actually inspired me to bake more cupcakes! It’s funny how that worked out..tasty, too. Hi! I’m wondering if this recipe can be adapted for a layer cake. I’ve been trying to find the perfect recipe for our anniversary party. My apologies for not responding sooner. Absolutely, you may adapt the recipe for a layer cake. I have not made it but my inclination is to make 1-1/2 times the recipe for a two layer 9″ cake.